President Trump’s plane hadn’t cleared Israeli airspace Tuesday before writers in the Middle East and at home began trying to figure out what the visit had meant. This was made harder because Israelis, true to the stereotype — two Israelis, three opinions — didn’t agree. Prime Minister Netanyahu and many legislators professed themselves delighted. But a key center-left figure called the visit “a missed opportunity of historic proportions.” The Israeli intelligence community was less tactful, using words like “horrifying” to describe an American president who shared Israel’s most sensitive intelligence findings with Russia. And that was before Trump brushed Netanyahu aside to tell the media that it was all okay because he never said the word “Israel” to the Russians — thus marking the first time a U.S. official had suggested in public that the sensitive material released came from Israel. As usual with all things Trump, who is right depends on how you frame the question. Trump and his hosts will reasonably claim it as a big win. But there are reasons to worry that the foundation of the U.S.-Israel alliance is getting shakier, and this visit did nothing to change that. Like other presidents who’ve gone abroad in times of turmoil, Trump will gain with his base. Fence-sitters in his party as well as influential foreign leaders will say, “That wasn’t so bad. Let’s give him some more time.” And Trump will gain with Palestinians for showing up, and with Israelis, whose views of him had slipped before the trip. Israel’s beleaguered center-left allowed even itself to wonder: Could unpredictable, nontraditional Donald Trump do what Obama and Bush had not, and force both sides to the negotiating table? We didn’t get an answer to that question. Obama-era ambassador to Israel Dan Shapiro suggested on Twitter that either Trump’s visit was substance-free — or he “is being uncharacteristically subtle” in planting the seeds for new round of peace negotiations. But I’d argue that the answer is both. With a lot of help from his team, Trump’s speeches and appearances in Israel were quite subtle. The plan — and one of the guiding ideas behind this trip — is that together they form a structure of ideas and presidential principles that bureaucrats, and the few political appointees Trump has in place, can use to run a coherent Middle East policy while Trump exists as more of a figurehead than a day-to-day decision maker. The next time the president says our alliances are outdated, or our partners are ripping us off, or a White House staffer refers to “Palestine,” Israeli officials can be reminded that what he “really” meant is in the speech he gave during this visit, and that the proof is in the new arms-transfer agreements with Israel that continue and build on the record-setting military support of the prior eight years. On the other hand, while Trump may believe he has now laid the foundations for a push toward peace negotiations, his critics are correct that they are foundations without substance. Trump maintained his studied ambiguity on whether he favors a two-state solution to the conflict. His two days in Israel passed without any public statements on the defining, real-world elements of the Israeli-Palestinian conflict: no mention of “settlements,” or “final status,” much less “statehood” or “refugees.” Trump’s peace negotiator Jason Greenblatt, who has gotten good initial marks from Israelis and Palestinians, would need clear guidance about where and how to push on those core issues to succeed. No one watching the visit believes he has that yet. 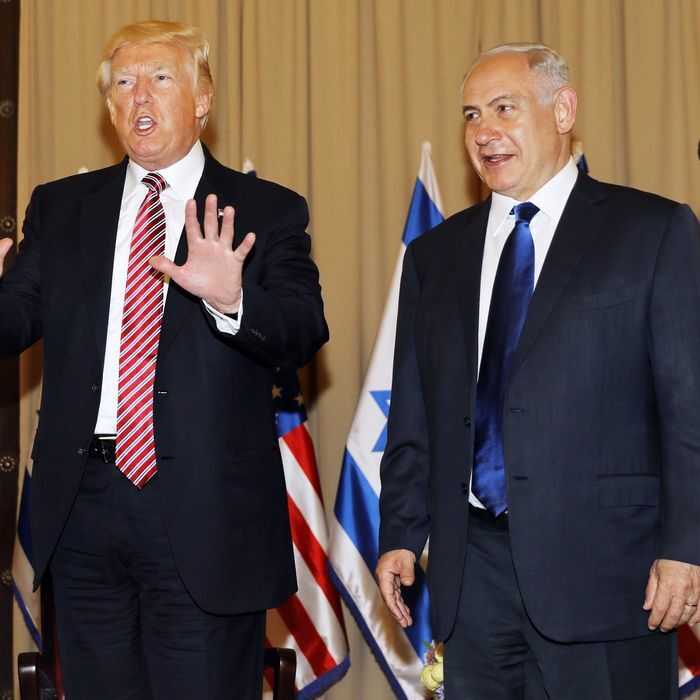 What’s more, peace advocates across ethnic and ideological lines have struggled to come up with ways any American president, of any political persuasion, can shift growing skepticism among both Israelis and Palestinians as to whether a two-state solution is achievable. Trump’s visit did nothing to help with that fundamental problem. And while the Israeli government breathed a sigh of relief, the very public rage of the Israeli intelligence establishment may be undercutting one of the strongest U.S. relationships in the region. Though it won’t show in the photos, Trump’s carelessness bodes ill — in the short-term, for the intense engagement and rebuilt relationships a peace process would require, and in the long-term, for his grandchildren’s ability to visit those Christian, Jewish, and Muslim landmarks at peace.